A few more out of cycle rate hikes are starting to look inevitable. Looks like the banks are going to start raising rates for investors again. This isn’t about the RBA. Never mind the strong GDP print last week or the unexpectedly good news out of the US, this is all about the banks and the banks’ business model. And that business model means that rate hikes are looking inevitable. Word on the street (through the AFR’s ‘Street Talk’ column) is that NAB is about to raise rates for investors on its principal and interest book. They’re saying that NAB will increase rates by 0.15% for investors with a P&I loan. The change is expected to take effect on April 4. Its not clear why they’re going after P&I investors and not interest only ones as well, but that’s they’re choice. Seems they’re launching a new mortgage pricing structure that groups home loans by both borrower (investor or owner-occupier) and loan structure (IO or P&I). Anyway, where one of the big four go, the rest of the industry tend to follow, so we can probably expect out of cycle rate hikes across the lender stable. We saw the first out-of-cycle rate hikes about 6 months ago. These came in response to APRA concerns that investor mortgage books were growing too quickly and they wanted to slow things down a bit. But this is different. This isn’t about toeing some regulatory line. This is about the banks’ business model and preserving margins. Now, it is all about bank funding costs. Australian banks (to be fair, like most international banks) get a good share of their funding from off-shore. That is, a lot of the money they lend to investors and owner-occupiers is first borrowed on international capital markets. In Australia’s case, our major banks source about a third of their funding offshore. Trouble is though, that the costs of these funds has been rising. 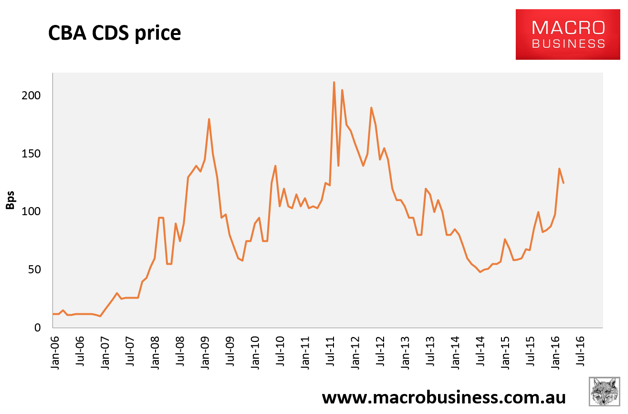 This chart here shows the CDS price for the Commonwealth bank. These are the costs facing the big four. The regional banks will be paying premia on top of this. Anyway, this chart shows how much costs are rising. Right now, we’re getting towards levels only seen in the GFC, and the recent Greek crisis. Partly this is about the banks. There are growing concerns about how exposed Aussie banks are to mortgages – concerns the hedge funds have been taking advantage of recently. That means that Aussie banks in particular are facing bigger costs. But mostly it is just where international capital markets are going. Everyone is nervous. China looks shaky. Money is just getting harder (or more expensive) to come by. And that leaves Aussie banks a bit stuck. So if funding costs rise, they get squeezed. That means they either take a hit to their profit margins, or they pass on the costs to their customers. Since this is all a bit tricky to explain to their customers, who are ready to blame them for being greedy banks, or switch to another lender, they tend to try and ride out the cost pressures for as long as they can. But it seems that we’re approaching a limit, and banks will be forced to pass hikes on to customers. And probably the best indication of that is how many short trades on the banks are currently in place. That is, how many bets are there that bank share prices will fall? The answer, right now, is a lot. 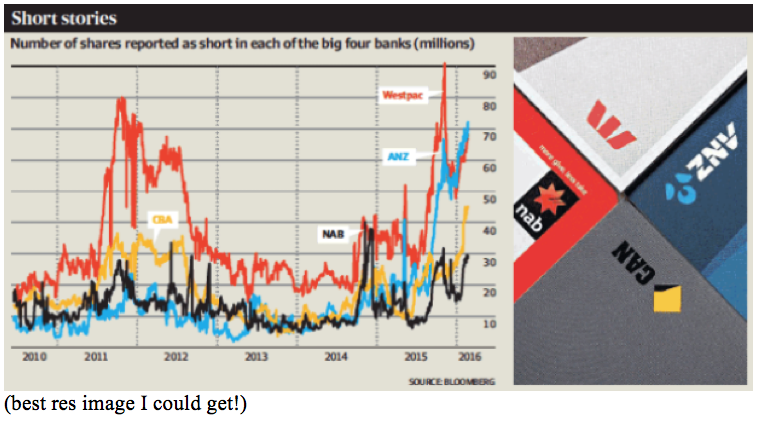 The AFR reckons that bank shorts have sky-rocketed over the past 12 months. That’s the biggest short position since ASIC started monitoring them back in 2010, but some traders say it’s the biggest short position since the GFC! So things aren’t looking great for the banks. But ultimately, that’s not great news for us either. Sooner or later, they’ll pass those funding costs on. We’ll be paying higher rates. And in the case of NAB, it looks like sooner rather than later. We’re probably not talking huge numbers, but for serious investors with large portfolios, every bit counts. The only sliver lining in this story is that banks will increase the deposit rates they’re offering, to try and secure more domestic funding. We’re already seeing the first waves of this. Comparison site Mozo reports that ING Direct, CUA, Newcastle Permanent, Greater Building Society, Arab Bank Australia and Westpac all raised term deposit rates last month. That might be nice for the cash you keep on hand, but money in term deposits isn’t really working for you. This stuff tends to be slow moving, so I’d be expect rates to drift higher on the back of higher funding costs over the next 6 months. Funding costs will need to stabilise or start falling before we can be confident that we won’t see any further out of cycle rate hikes. So I’d be factoring this in right now. Be prepared for rates to edge higher, and with APRA looming over the sector, expect investors to be first in the firing line. It’s not going to rock the market, but it’s something to be tuned into. Can you cope with a .15% rate rise in the next 6 months? What does a rate rise mean for the strength of the current property cycle?